Washington Fire Chief Tim Downing presented Doris Smith with a certificate of appreciation Wednesday evening. New Washington Fire Department Chief Tim Downing was given his badge by wife, Kate, as Washington C.H. City Council Chairman Jim Chrisman and Washington City Manager Joe Denen look on during a ceremony Wednesday evening. 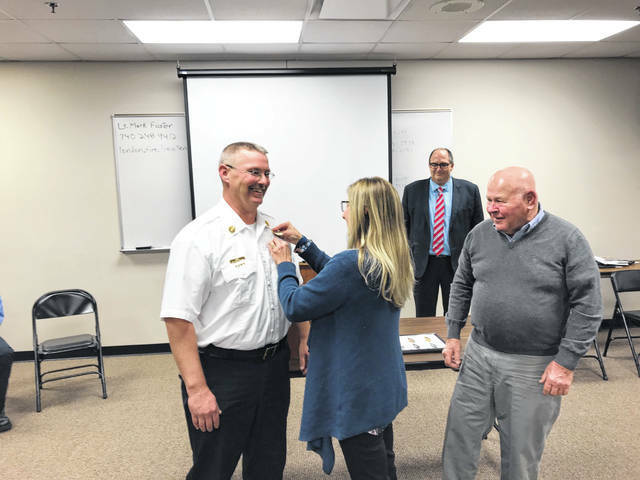 With a new chief and series of promotions, the Washington Fire Department celebrated a time of transition Wednesday evening. Washington C.H. City Manager Joe Denen introduced the incoming chief, Tim Downing, who is replacing the retiring chief, Tom Youtz, in the downstairs area of the firehouse in front of family and friends. Denen said he was also proud to introduce the other integral members of the fire department. Along with Downing, Jason O’Dierno was promoted to captain, Casey Coil was promoted to lieutenant, and three new firefighters were recognized: Scott Monroe, Matt Smith and Steve Yeoman. Washington C.H. City Council Chairman Jim Chrisman presented family members and significant others of these individuals with the badges, which were then pinned onto the uniforms of the firefighters. After Downing received his badge from his wife, Kate, he spoke to the crowd of the importance of family. 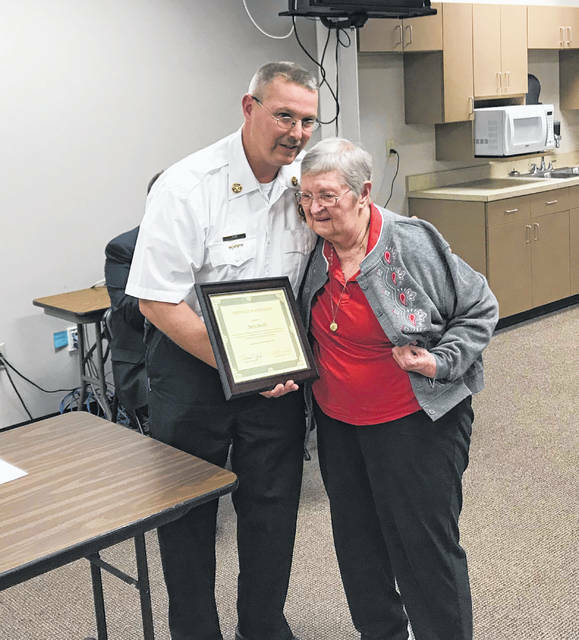 In order to properly recognize the family members of firefighters, Downing presented Doris Smith, grandmother of Matt Smith, with a certificate of appreciation. Her husband, Don Smith, was a firefighter and photographer for the Washington Fire Department, and her two grandsons are both in fire service. https://www.recordherald.com/wp-content/uploads/sites/27/2018/11/web1_18B6E4CF-F2CE-4E6C-91C8-4120683DCE22.jpgWashington Fire Chief Tim Downing presented Doris Smith with a certificate of appreciation Wednesday evening. https://www.recordherald.com/wp-content/uploads/sites/27/2018/11/web1_B3B8A552-E45B-424D-8EE6-0AB5548FF856.jpegNew Washington Fire Department Chief Tim Downing was given his badge by wife, Kate, as Washington C.H. City Council Chairman Jim Chrisman and Washington City Manager Joe Denen look on during a ceremony Wednesday evening.